Today was another day of beautiful but slow riding. The day started out with the same type of riding we encountered yesterday – beautiful mountain twisties through lush jungle with amazing vistas. The speed was still 40KPH for most of the day, and the twists were tight enough and frequent enough to warrant it. There were a couple of parts where we could get up to 60KPH (not quite 40MPH) but for the most part, it was slow going. As we rode, the terrain changed. It was still mountainous, but the trees began to change from jungle-like to – as Kay put it – “Colorado.” They were more deciduous -type trees – less jungle. Then, the trees and landscape changed again to “Nevada.” Desert complete with cacti. It was my first time riding through desert landscape, and I thought it was all beautiful. The lush jungle landscape appeals to my imagination more, but the desert landscape is easier to see (because it’s not as dense) and just as beautiful. So people? If you’re looking for twisties that will keep you occupied for days through some of the most beautiful terrain you could encounter, check out 85 south from Ciudad Valles through Ixmiquilpan. You couldn’t ask for more beautiful roads or better riding. Kay and I agreed at one point that we thought we’d have to go a lot further before we had terrain and riding like this. We had an adventure ordering lunch today. We finally figured out (although Kay said he had suspected) that “commodore” means restaurant. We went to a commodore in one of the towns we passed through along 85 – pretty much the first one we saw that had parking, as we hadn’t eaten breakfast and were getting quite hungry. We walked inside, and the restaurant was dark but women were cooking in the open kitchen at the back. We tried to ask for a menu, but there wasn’t one. One of the women was tending some tasty-looking stews, and we tried to ask what was in it, but we didn’t understand the responses. Finally, we settled on asking for “enchiladas” and got a very tasty meal. There was tortilla with some sort of red sauce and queso fresco, roasted meat (beef), black beans, onion, tomato and avocado. It was delicious. The cost for both of us was just over $5. It was a tasty, filling meal and I’d love to eat it again, or anything else that came out of that kitchen, based on the tastiness of that dish. 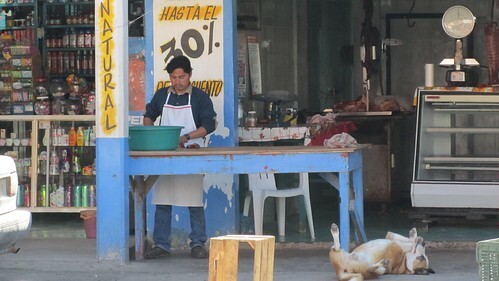 We sat outside on the porch overlooking our bikes, and watched a butcher across the street taking apart a pig while a dog hung out nearby, hoping for scraps. It was a peaceful, happy moment, and a nice window on Mexican life. At one point in the afternoon, we had to stop and get out Kay’s laptop because we couldn’t figure out how to find our next waypoint in our GPS. Kay looked but it apparently hadn’t imported properly. So we had to get the laptop out, look up the coordinates and then input them into the GPS manually. We discovered, at this point, that Kay’s left pannier was coming off the rack. The two top pucks had come undone completely, and the only thing still holding the pannier on was the tie-down Kay had been using to keep the rear tires on his bike. 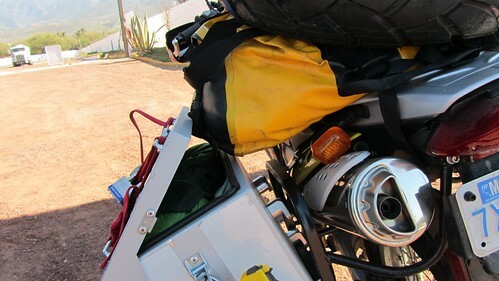 This was user error (I mounted that pannier this morning to try to help Kay get ready to head out, and I apparently didn’t tighten the pucks enough) but my TraX panniers are SO MUCH easier to take on and off the bike. Even if they do crumple like paper at my first off, all of the ease of dealing with removing them, etc. this whole time until I do have an off is worth it. The riding was slow up until 2-3PM, when we finally got into Ixmiquilipan. Today’s destination was going to be an archaeological site at Tula whose name I keep forgetting. It’s supposed to have these large head-totem things that are quite impressive. (Can you tell that Kay researched these spots for us? I have no idea what we’re going to see, but there are signs for it!) Unfortunately, because of the slow riding, we didn’t get to this site at Tula until 4:56PM. There was still plenty of sunlight, but the place was closing and the guy wouldn’t let us in. So we turned around and headed into Tula in search of a hotel. Unfortunately, we’ve gotten into really populated areas near Mexico City. It wouldn’t have been possible for us to hidey-camp today, so we were stuck in yet another motel. And contrary to what people keep telling us about hotels being cheaper the farther you go, we paid the most we’ve paid for a hotel yet – $450 MEX, or around $40 US. 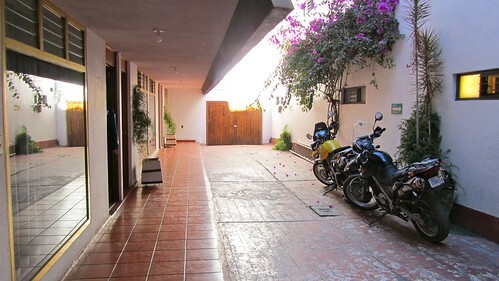 The parking for our bikes is quite secure – we’re inside a courtyard, and they’ve let us pull the bikes up right into the open-air hall in front of our room – behind a wall and not even visible from the courtyard parking lot. We walked down the street to where we’d passed a movie theater with the thought of grabbing a bite to eat and seeing a movie. Kay thinks it would be a novel experience to catch a movie in a foreign country. We were surprised to see that most of the titles were American. The price for general admission was just over $4 US ($49 pesos) and a 3D movie was around $6.50 US ($79 pesos). Unfortunately, by the time we got around to checking out the movies, we were both getting tired – and were worried about the state of our colons because we’d drunk fountain soda from a nearby Burger King. (Yes, we ate dinner at a Burger King. Because it was late in the day, it was one of the few things still open. The BK menu was almost exclusively in English, and with the exception of the hamburger meat tasting different, it was almost exactly the same as eating BK in the US.) Having drunk the fountain soda, it occurred to us to wonder if the soda machines were hooked up to a local water supply or how they mixed their soda. If it was local water, we wanted to be near the comfort of the toilet in our hotel room just in case it had negative effects. Luckily, so far so good. We’re planning to still see the archaeological site in the morning, but sadly we’ve got to head into Mexico City after that. We made an unfortunate discovery today – Kay’s fork seals seem to be going. 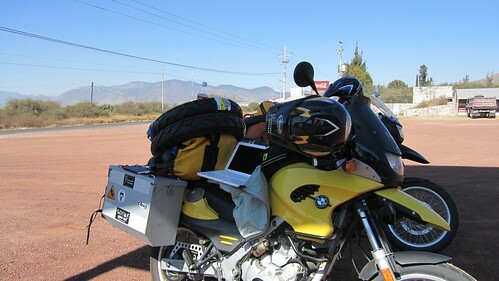 The left fork is weeping fork oil, and as much as we’d prefer to avoid driving in Mexico City, we’d rather get it taken care of at a BMW dealer than wait until we get further south and hope the seals don’t give way completely. We’ll also try to get the oil changed in both bikes there, and pick up a new rear tube for the bikes since we used one of our spares on mine. Hopefully the BMW dealer can get us in and out fairly quickly, but I’m still expecting we’ll have to spend at least another night in a hotel either in Mexico City proper, or just outside of the city. I don’t think we’ll get very far today.